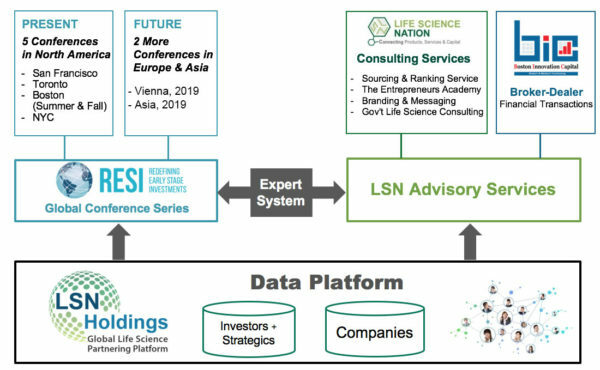 LSN’s unique position in the early stage space, and the range of capabilities we have developed, provide a strong foundation for a sourcing and ranking service. By leveraging the LSN global partnering platform, SRS provides clients with a comprehensive opportunity to quickly source, vet, rank and engage with partners that are licensing technology assets. SRS allows clients to expeditiously find and de-risk early stage technology assets and to immediately focus on top-tier assets that align with their interests. 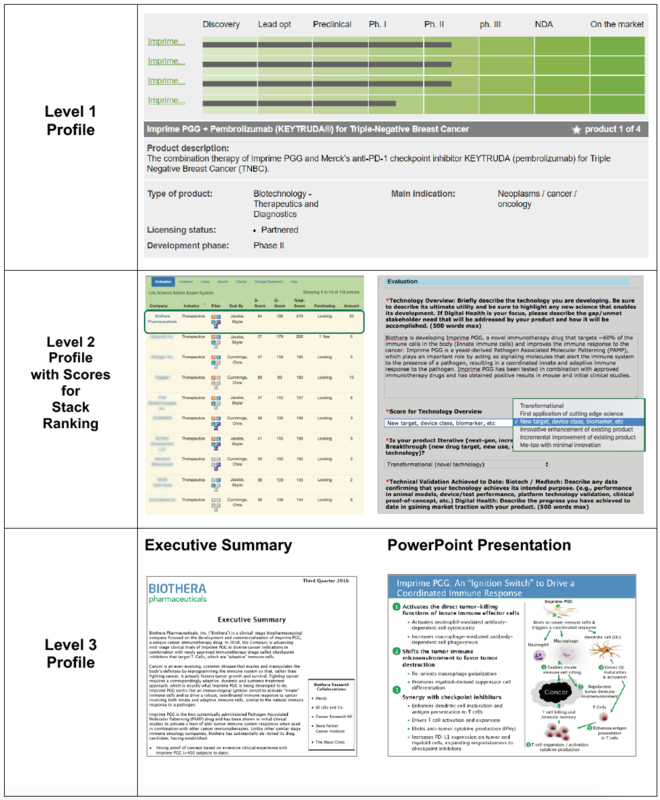 LSN has developed a unique process that works with the client’s strategic pipeline projects. By merging the LSN database with Salesforce.com, we offer our clients a customized CRM solution. Every project is provided with a transparent cloud-based portal for real-time status of the project and views into all ongoing dialogues with all the potential firms involved in the process. Clients rave about having this 24/7 connectivity to the CRM and feel they are a part of the process. One big advantage is that LSN is global in nature, meaning all of our projects are global and not stuck in a specific region. By playing a global numbers game, our clients have access to a greater pool of technology, which casts a wider net and allows for finding the best technology. The LSN SRS product has built-in flexibility, which means you can pivot on the fly as you learn more about the early stage domains of interests. Starting with a detailed assessment of the clients’ investment interests, LSN will conduct a global search for assets within that interest area, and LSN’s Expert Ranking System will be used to stack rank assets based on technical and business criteria (80 to 100 assets anticipated). LSN will conduct a detailed assessment of the companies holding the top 10 to 20 assets. 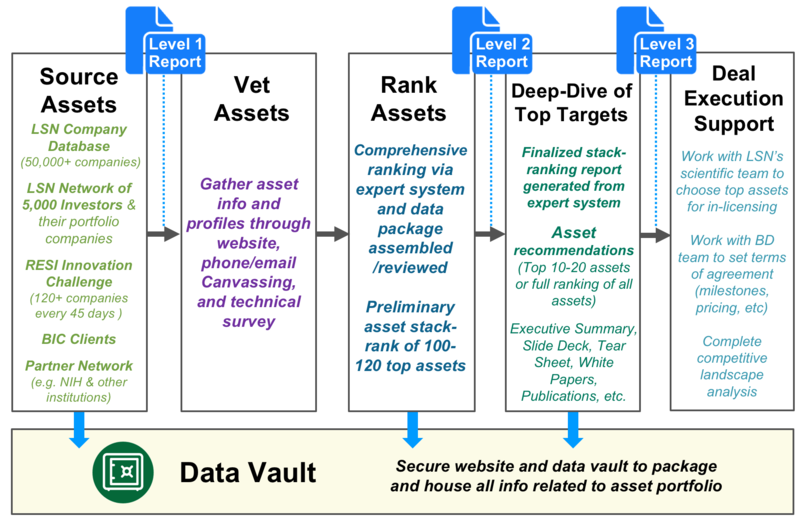 Clients will have access to an online ‘data vault’ with all asset information. LSN’s research team will work closely with clients to understand their investment preferences. Our goal is to understand our client’s focus area and align that with the global market dynamics that impact what they wish to invest in. LSN will conduct a global search for assets that fit investor criteria and then use LSN’s Expert System to stack-rank assets based on technical and business criteria. SRS will allow the client to avoid the lengthy asset research stage and immediately enter the diligence process with owners of top assets. Contact us now to request an SRS Proposal focused on top-tier assets that align with your interest areas. Below showcases a search for a big pharma partner interested in sourcing global assets in the biologics for oncology space. 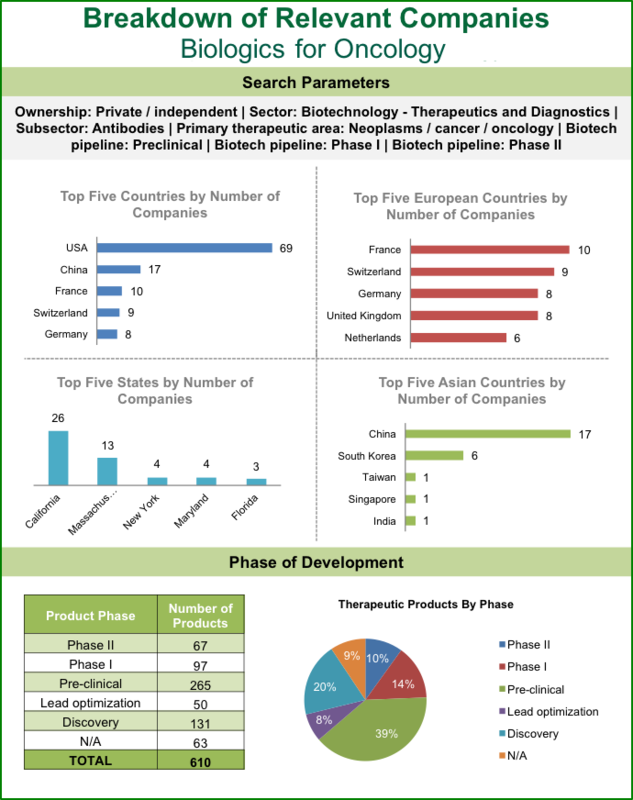 The client specifically mandated preclinical, Phase I and Phase II assets that are in development from private biotech companies.